The Gadget: The iLynx, a wedge-shaped USB and Firewire hub that provides four USB 2 ports and two Firewire 400 ports. Its most distinguishing feature is that it matches MacBook Pros. The Verdict: That's pretty damn expensive for a non-powered hub, even if it does look quite nice. 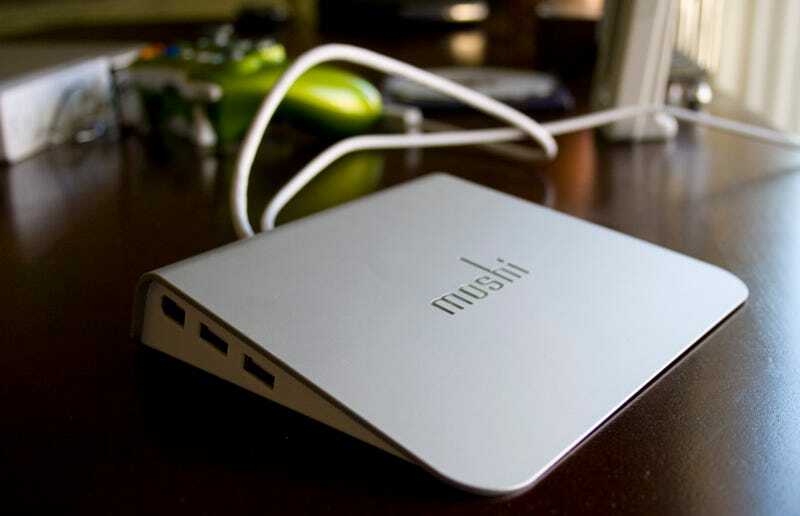 The moshi logo on the front lights up, the wedge is nicely shaped and it just looks nice, but $60 is quite a lot for a hub. It comes with both a USB extension cord in case your machine (MacBook Pro or iMac) is slightly further away from your hub, and a Firewire 400 to 800 converter. But the setup does work, which is what's important. Update: The hub supposedly acts like a powered hub without an AC adapter because it draws power from the USB and Firewire ports (if they're both hooked up), so it can power more things than standard USB hubs.